Entries with Topic Urban . The black-on-white Global Urban Footprint (GUF) map is a portrait of the human presence on Earth in 2012, to a maximum resolution of 12 m, covering even single houses. 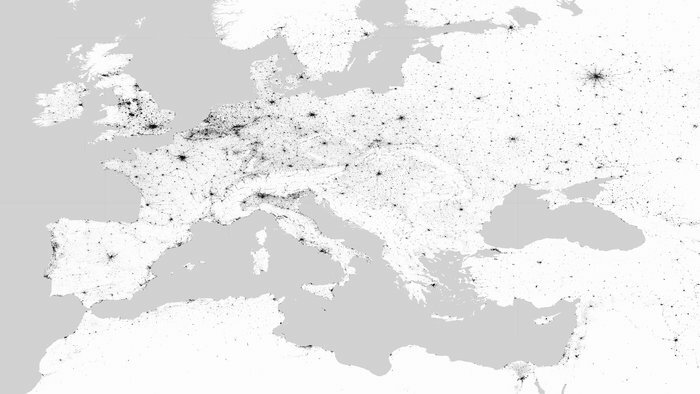 Starting this month, the GUF 2012 dataset is freely available via ESA’s online Urban Thematic Exploitation Platform (U-TEP) at full spatial resolution of 12 m for scientific use, along with an easier to handle 84 m version for any non-profit use. “Previously we just weren’t getting all the villages in rural areas,” says Thomas Esch of DLR German Aerospace Center, which produced the map. “But these might be crucial to understanding population distribution or disease vectors, for example, or assessing pressures on biodiversity. The UTEP is one of six ‘Thematic Exploitation Platforms’ (TEPs)' being developed by ESA in the frame of the Earth Observation ground segment evolution strategy. The TEPs aim at fostering the exploitation of EO data by providing an online environment for users to access information, ICT resources, and tools.